b. To avoid escape/crashes/errors with the shift function of Ultimarc's Ipac (especially when exiting games and going back to the frontend) you must reassign escape to P2 button (Preferences/Controller/quit executable to "2") and use an 2 second delay to avoid accidental escapes. (go to; Preferences/controller/delay - make 3 seconds for 'quit excecutable). c. To avoid escape/crashes/errors with N64 emulator Prodject64 disengage the escape key in the N64 emulator. Go to; options/setting/keyboard shortcuts/file menu/exit and Game Playing Fullscreen in the CPU state pulldown menu. d. Go to; Preferences/options/mame/check "mame rom description" and increase "delay while generating mame xml" to "444" or something very high so Max. Arc. doesn't time out while generating long mame lists. e. To avoid getting the Black Screen Of Death exiting games? (1) Set task priority for frontend to HIGH! This slider allows you to control the level of priority given to the frontend as it runs as a background task. Slower machines should have this setting to high. 2. Go the Mame ini file and move it's priority setting to -10. The range is from +1 to -15. Also; change the "esc" or "exit" key in mame. Start a game, press the [tab] button, and select "Input (general)" in the menu list. Change "UI Cancel" to the key, ex Q, you want to use instead. in the "Configuration for:" field select "MAME"
in the "Use exit hook:" field, press the 2 player button so the field says "2"
ahk script that tells the computer to send esc when 1 & 2 are pressed at the same time. It seems to help to make sure the "1&2" button up signal is sent before esc. See below. Each script is a plain text file containing commands to be executed by the program (AutoHotkey.exe). A script may also contain hotkeys and hotstrings, or even consist entirely of them. However, in the absence of hotkeys and hotstrings, a script will perform its commands sequentially from top to bottom the moment it is launched. Right-click the file and choose Edit Script. Double-click the file to launch it. A new icon appears in the taskbar notification area. Hold down the Windows key and press the spacebar. A web page opens in the default browser. To exit or edit the script, right-click the green "H" icon in the taskbar notification area. Multiple scripts can be running simultaneously, each with its own icon in the taskbar notification area. Each script can have multiple hotkeys and hotstrings. To have a script launch automatically when you start your computer, create a shortcut in the Start Menu's Startup folder. I been getting bombarded recently with problems regarding how to exit an emulator and return to the game selection window of Maximus Arcade. Here's a troubleshooting guide to assist with all of the questions. Q: The screen is black and MA appears to have crashed. How do I return to the game selection window? Q: Why do I have to double punch the 'quit executable' button to exit? A: Sometimes you will need to double punch the 'quit executable' button. This may be necessary because an emulator is using an usually high amount of the cpu processor and MA can't see the keypress right away. Generally holding the key down for 1 second or more is enough. Q: The 'quit executable' button works fine when I have the quit delay set to zero. Why when I set the delay to 2 seconds or more it never works? A: Are you using a key combination to initiate the 'quit executable' key? If yes, are you using an IPAC board? If yes, does it have a PS2 or USB cable? I've recently found that IPAC boards using a PS2 cable tend to only send a single keystroke when a key combination is held down. So if you hold down the SHIFT+CONTROL keys for instance, to send the ESC key as your 'quit executable' button, it only gets sent once and no keydown state is recognized, but if the IPAC is using a USB cable, then key combo does initiate a continuous keydown state for ESC. Which means that the quit delay option won't work for a PS2 cable IPAC because the key-combo isn't recognized as a continuous keydown state. To see whether a continuous keydown state can be maintained, hold down your key-combo in a program like notepad. Q: I'm using a gamepad/joystick as a controller. When I assign the 'quit executable' button for my gamepad it works within MA but when I launch a game, only the keyboard assigned 'quit executable' works when exiting an emulator. Why is that? A: Some users are experiencing problems when exiting an emulator with their gamepad/joysticks. The problem has not been isolated and it is still being investigated. In the meantime, a resourceful group of users have used the program JoyToKey to map the gamepad/joystick button to the 'quit executable' keyboard input. I am Jeremy from Xgaming, Inc., and I'm going to try see if I can help find a workaround or fix for this issue until mameseer is able to nail it down once and for all. Please know that we have not been in touch with him, so we don't know anything more than you do at this point. He is more than welcome to contact me directly if he wishes. First and foremost please do not trash the software or mameseer in this thread as it will only get it closed…take that to another thread please. If I am correct in my findings, this problem has nothing to do with the X-Arcade at all, but may indeed a small bug in the Maximus software or Windows 7. EDIT: This may be a problem in Windows 7 only, please confirm your O/S and whether you have the same problem. To replicate the bug consistently, simply hold any numpad direction (2,4,6 or 8 = Joy1 on the X-Arcade) and then hit the Shift key (= Button 4 on the X-Arcade - LK on SF, LP on MK). Now when you try to exit a game you will see the bug. Furthermore, if you do the same combination while in the Maximus menu, you will see that direction will get stuck. You can also see it happens in the X-Arcade Test Program. Bug identified. Option 1. Spin Joy1 in a complete circle before exiting a game. If you get the black screen don't panic, just spin joy1 again and use the exit command again. Option 3. Reprogram the X-Arcade to use different keys for Button 4 (Shift) or Joy1, change settings in Maximus to match. 1. If you move joy1 in all directions (or technically just the direction it got stuck in), you can then use the Exit Game command to get back to the Maximus menu. 2. Hit ALT+TAB and then ALT+F4 to close Maximus. 3. Hit the Windows key (or CTRL+ESC), then right-click on the taskbar button for Maximus and choose close. I have also noticed that you cannot exit Maximus using ALT+F4 unless you first hit Alt+Tab. I don’t know if this is related or helpful. Please try these solutions out and see if my findings are correct, or if there is more to it that I have missed. I don't have the tansktick but I wrote this small tool that turn off the num lock, so you can use with the "Run application on startup" option if you wish. Nice. But can you do this same thing using a script? If you check the priority of Notepad.exe (either using a script or using Task Manager) you’ll see that it now has a priority of Below Normal. 1.) when I press DEL. If I press ESC in Mame I get the "Black screen of death" but if I then press DEL or one of my Combos it'll exit out to MA. It seems that If you press ESC MAME will exit but MA does not recognize it as "MA" command and fails to notice that MAME has infact terminated. So "sharing" command keys seems to f*ck things up. Let ESC exit Mame in Windows but let DEL terminate your Emus in MA. Reassign your keys show us the videos..... Good luck. VJoy Virtual Joystick Driver can create virtual joysticks in Windows, and comes with a tool which allows you to map keystrokes to the virtual joysticks axes and buttons. Our custom ini will map the X-Arcade to the same buttons layout as a Xbox 360 controller in Windows. This means that any game you play that has an Xbox 360 controller option will work with no additional setup needed. You can use our 2in1 adapter to connect your X-Arcade to your PC so that it acts like a normal game controller, but this will requre using a special driver and software called MotioninJoy (We can't help you with this). Alternative. You can also use a Playstation2-PS3/USB adapter (or our Xbox 360 adapter kit) along with our Playstation 2 adapter to connect your X-Arcade to a PC via USB. This allows you to change modes just like on the PS2 & 3 console. MaxismusArcadeInstallInstructions wrote: Pressing the PREVIOUS/QUIT EXECUTABLE button on this screen will return you to the emulator/executable selection screen. The loading screen shows while the media is opened with the executable. 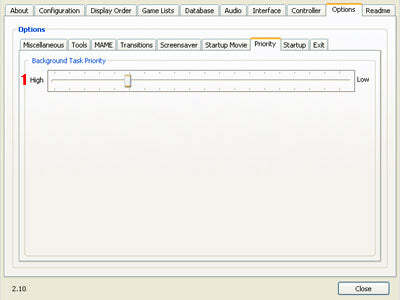 At this point, the frontend becomes a background task that waits for the PREVIOUS/QUIT EXECUTABLE button to be pressed. Once the PREVIOUS/QUIT EXECUTABLE button has been pressed, the frontend will attempt to quit the emulator/executable for you and return to the media selection screen. Make sure that you are exiting your emulator/executable by pressing the PREVIOUS/QUIT EXECUTABLE button that was mapped in the the frontend preferences panel,not the default emulator quit key. In some instances you may have to press the PREVIOUS/QUIT EXECUTABLE key twice. In the case of some emulators, you may have to hold the key down for up to 10 seconds. OK OK spacegoogie... here is my latest. Most games would exit except Mortal Kombat. So I set the sensitivity back to where it was before I changed it and Mortal Kombat still would fail. I looked around prefs and got it to work AGAIN. 55 is left alone to guarantee proper cooperation with other applications. 57 default is 0 (NORMAL priority). mplay32 /play /close "c:\windows\media\windows xp error.wav"
To play an audio file in a different media player, set the path to the directory of where the alternative media player is or move into the directory that contains the audio file. Otherwise you'll get an error message indicating that the command is not recognized. For example, assuming you wanted to play a MP3 file in the VLC media player. You could move into the C:\Program files\VideoLan\VLC directory or add the directory to your path. From this directory, type the below command to execute and start playing the MP3 file in VLC. Keep in mind that the mplay32 options mentioned above (/play and /close) do not work for every media player including VLC.